There have been five generations of the Land Rover Discovery, with the first model rolling off the production line in 1989. Since then, the Discovery has been recognised for its unique combination of off-road capability, practicality and comfort. The Land Rover Discovery Commercial takes that to a whole new level. With the removal of the second and third row seats, the load capacity opens up to 1,635mm long, 939mm high and 1,411mm wide through a (powered tailgate) boot opening of 1000 x 735mm providing 1,856 litres of load space. 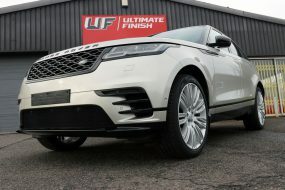 The 2.0D SD4 diesel provides 237bhp capable of towing up to 3.5 tonnes and JLR claims it returns a respectable combined use fuel consumption of around 40 mpg. 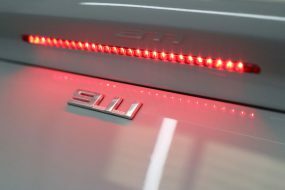 Fitted with 19″ alloy wheels, leather seats, air-conditioning and the InControl Touch Pro package, the Commercial S also receives, cruise control, a speed limiter, Autonomous Emergency Braking and Lane Departure Warning all as standard. For the discerning business owner or tradesman, the Land Rover Discovery Commercial S seamlessly blends style, comfort, on-road presence, off-road capability and significant load practicality. Representing a significant investment as well as being a highly visible part of his business, the owner of this new Discovery Commercial S was keen to ensure it looked the part. Also key to his decision to bring the vehicle to UF Studio for a complete New Car Protection package was his desire for it to be easy to maintain inside and out. New vehicles paintwork should be in pristine condition. To preserve this, non-contact decontamination products and methods were used to reduce the likelihood of inflicting swirls on the paintwork. First, the wheels and wheel arches were pressure washed to remove loose dirt before being washed thoroughly with UF Safe Wheel Cleaner to remove regular road contamination. Then, UF Iron + Fallout Remover was sprayed onto the wheels and under the arches to act on ferrous contamination, forcing it to break its bond with the underlying substrate and allowing it to be easily rinsed away. As ferrous particles (usually in the form of brake dust) are both sharp and corrosive, regular elimination is essential for preserving the integrity of the lacquer on wheels and on bodywork. Finally, the wheels and arches were degreased to remove oily contamination such as diesel or industrial fallout. With the dirtiest area of the car now clean, the same process was then followed for the bodywork. 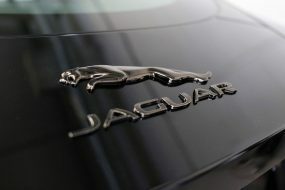 The bodywork was also treated with a dedicated tar and adhesive remover, to ensure any traces of the film the vehicle is protected with during transport to the dealership was removed. The final step of the pre-cleaning process was to apply Ultimate Snow Foam, a high-foaming cleaner that lifts dirt and grit away from the surface of the car, encapsulating them within the foam. The car can then be rinsed, removing an additional layer of contamination that might otherwise be caught in a wash mitt and rubbed across the paintwork during the main wash. The Discovery Commercial S was carefully washed with UF Pure Shampoo, a cleaner devoid of gloss enhancers or additives that may cause streaking or leave a residue on the paintwork. The slick formulation helps the wash mitt glide over the surface, reducing friction and helping to gently lift away contamination. The vehicle was rinsed free of suds before being rinsed with pure water from an Aqua Gleam De-ionising Water Filter. It was then brought into the studio and carefully dried, a BigBoi BlowR Pro was used to ensure all water was removed from tight areas such as around door trim, badges and the engine bay. Careful inspection of the paintwork and trim under high-intensity lighting revealed some light marks on the piano black trim of the door pillars. The wheels were removed and degreased once more before being washed and dried. The brake calipers were also deep cleaned. The calipers and wheels were dried using a BlowR Pro to ensure water was forced out from all the nooks and crannies. They were then treated with Gtechniq Panel Wipe to eliminate any remaining residue that might interfere with the wheel sealant. 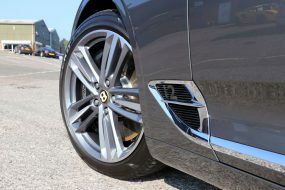 Gtechniq C5 was applied to the wheels and calipers to provide a hydrophobic barrier that also helps to inhibit brake dust particles from adhering to the surface. Heat resistant, C5 will not burn off as the wheels and calipers heat up and one layer will provide protection for up to twelve months. Treated wheels are easier to maintain with dirt, grime and other contamination unable to grip the slick surface as effectively. The paintwork and plastic trim were also sprayed with Panel Wipe to prepare them for the ceramic coating. Then, Gtechniq Crystal Serum Ultra was applied. Gtechniq is a UK manufacturer of innovative surface care products. Their sealants are all based on cutting-edge nanotechnology and many of their products also have anti-bacterial properties. Crystal Serum Ultra (CS Ultra) is their flagship sealant providing a tough, durable barrier that helps protect paintwork from wash-induced swirls, highly acidic or alkaline substances. Although applied as a single layer, CS Ultra cures as two layers, the lower layer curing to around 7H (on the pencil scale of hardness) and the upper layer curing to around 10H. This imparts flexibility and swirl resistance to the coating. The key to its comprehensive protection is the molecular formulation: using a larger nanoparticle of 20 nanometres (nm) together with a smaller particle of just 7nm allows the spaces between the molecules to be filled in, similar to sand being poured into a jar of pebbles filling in the gaps. This forms a strong interlinked bond between the two layers for maximum durability. For CS Ultra to cure optimally, the coating must be applied under tightly controlled environmental conditions with ambient air temperature and humidity within certain parameters. 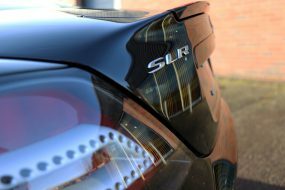 Sensitive to water, the car must be completely dry with no trapped water that might run down the paintwork whilst CS Ultra is curing as this causes the coating to become opaque rather than optically clear. Additionally, the preparation stages must be completed to the highest level, as once cured, CS Ultra will seal any imperfections beneath. For all of these reasons, CS Ultra is available only as a service through Gtechniq approved detailers. Once CS Ultra had been allowed to harden for a couple of hours, Gtechniq EXO v4 Ultra Durable Hydrocarbon Coating was applied over the top to add slickness and an enhanced hydrophobic function. Coming into winter, inclement weather conditions are to be expected. To help keep the windscreen clear, Gtechniq G1 ClearVision Smart Glass was applied. Laying down a hydrophobic layer encourages rainwater to roll into beads on contact with the treated surface and these are then easily blown away, even whilst driving at relatively low speeds. In addition to shedding water, the coating also encourages contamination borne by the rain to be dispersed rather than to adhere to the glass. Using such a coating on all the windows greatly improves vision all around and making conditions less taxing and tiring for the driver. G2 is first applied to the windows to prepare them for the coating. Then, the first layer is applied using a horizontal motion and allowed to rest for five minutes before a second layer is applied using a vertical motion. This is also allowed to cure before a third coating is applied using a circular motion. This method ensures every inch of the glass is covered and therefore fully protected. As the Discovery Commercial S is going to be used daily for work, the owner opted for the leather interior to be cleaned and protected too, to preserve the colour and texture of the material. Colourlock Mild Leather Cleaner was first used to remove dirt, oils or greasy leather dressing that might have accumulated or been applied at the dealership. To protect the leather, Colourlock Leather Shield was sprayed onto the clean leather. In addition to providing a hydrophobic and anti-static barrier, Leather Shield also offers protection from the harmful effects of UV, the main cause of leather drying out and cracking, as well as causing pigments to fade. With the comprehensive protection package complete the Discovery could be admired before being taken off to start earning its keep!